05-04-2018 - National Targeted Event (HU) - The digital revolution comes with new achievements every day and offers solutions that are capable of dramatically affecting our everyday lives - all in the near future. But are there any unwanted negative side effects of these? 19-03-2018 - Rosie Infographics - Our colleagues from the First Hungarian Responsible Innovation Association provided three infographics describing three main RRI tools used in the Rosie project: UNI standard, Living Lab and STIR method. 13-03-2018 - The second Capacity Building Session will be organized in Zadar, Croatia. The session will be focused on UNI/PdR 27:2017, STIR Methodology and Living Labs approach. 12-03-2018 - The second ROSIE project meeting will be realized on Monday, 12 March 2018 in Zadar Croatia. The programme will be focused on technical work packages. 22-01-2018 - National Targeted Event (CZ) - The first National Targeted Event was organized together with the workshop "Big and Open Data and Open Software for Real Life" in Prague, Czech Republic. During the workshop questions related to RRI were discussed with SMEs as well as with colleagues from the D-STIR project. The main topic of the workshop and following hackathon was open access (as one of the themes of RRI). The event was visited by about 100 participants from SMEs, state administration, universities or NGOs. 28-11-2017 - Training of Trainers - the Education of RRI experts was organized in the Hotel Galaxie, Prague, Czechia. The Capacity Building session will be focused on understanding RRI and RI assessment tools as well as RI consultant profile. 01-10-2017 - ROSIE project has two new social media channels: Facebook Page and LinkedIn Group. If you like the ROSIE project, please support us in our social media channels. 21-09-2017 - 20 Years CE - ROSIE Project partipated in the super-lively 20 years celebration of Interreg CENTRAL EUROPE in Berlin, Sept. 20th and 21st. 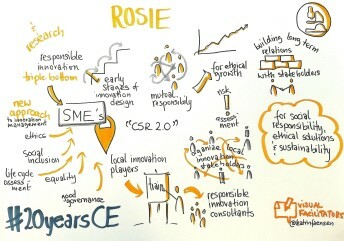 We pitched ROSIE with all the energy and passion - see the visual rendering of the concepts included in ROSIE. 13-09-2017 - The Launch Event was organized by CISE in Rimini, Italy (Launch Event Report). There were introduced following presentations: UNI/PdR 27, STIR methodology and Living Labs. 12-09-2017 - The Kick-off Meeting is organized by CISE in the Hotel Villa Rosa Riviera in Rimini (Marina Centro), Italy. The agenda includes introduction of work packages and the First Launch Event. 04-09-2017 - Project partner EMFIE has prepared the first ROSIE video showing the essential principal of the project. The video is published in YouTube. 01-07-2017 - ROSIE project started offcialy! During the first month project partners participated in the Virtual Kick-off Meeting (26-07-2017).